Who knew that 140 characters (280 now) could pack such a marketing wallop? Twitter started out almost as a stream of consciousness, microblogging site, but it has grown into a marketing powerhouse where brands like Wendy’s and Skittles, among others, are embracing the casual atmosphere to engage customers in a way traditional marketing simply can’t. Or won’t. 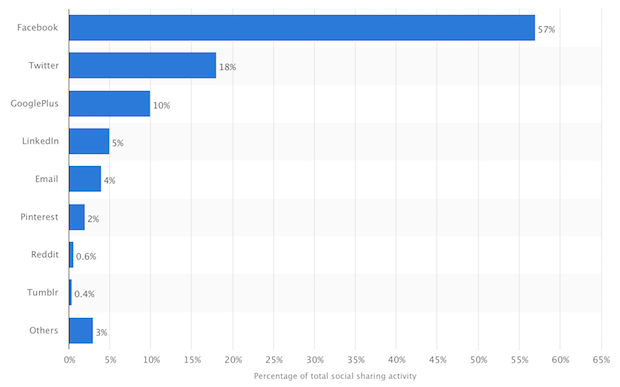 While Facebook is certainly the social media matriarch, accounting for 57% of global content sharing activities, social media platforms like Twitter, Instagram, and even Snapchat shouldn’t be ignored. Twitter still beats out email for total social sharing activities at 18%, after all. Choose a template. Instead of one of the pre-designed templates, we’ll build one from scratch using the Canvas template. This’ll make it easy to implement the code we’ll get from Twitter. 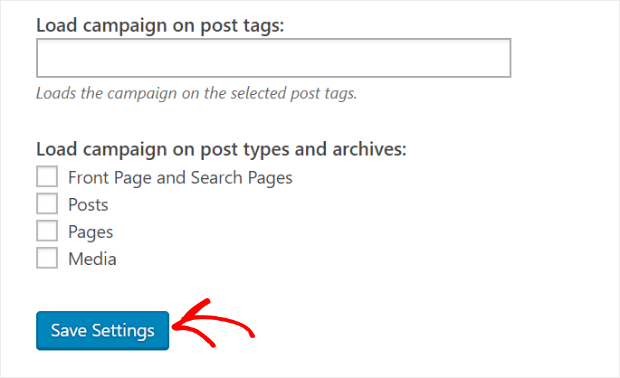 Leave the campaign builder open, and open the Twitter Publish tool in a new browser tab or window. For this example, we’re going to get the code for a large “follow” button that shows our username. Start by selecting the Twitter Buttons option. Select Follow Button from the options that appear. Add the Username you want to create the button for and click the blue Preview button. Since we want to use a large button, let’s go ahead and click on set customization options. 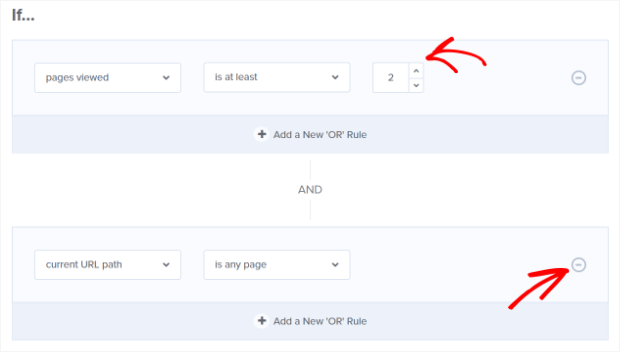 Select the checkbox next to Large Button and click the blue Update button. Click the blue Copy Code button. 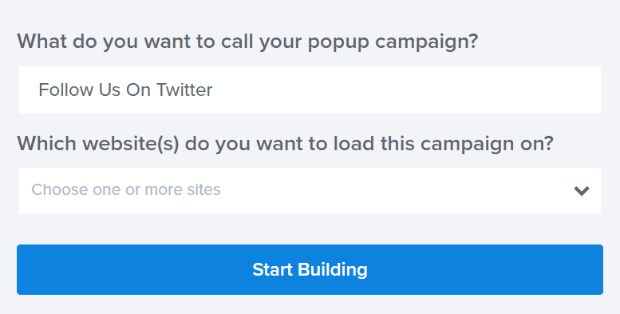 Go back to the campaign builder, and paste the code you copied from Twitter. If you want, you can center your button by adding <center> </center> around everything inside the div codes. So far we only have a button. Let’s add some text to give folks a reason to follow us instead of just showing them a button with no context. 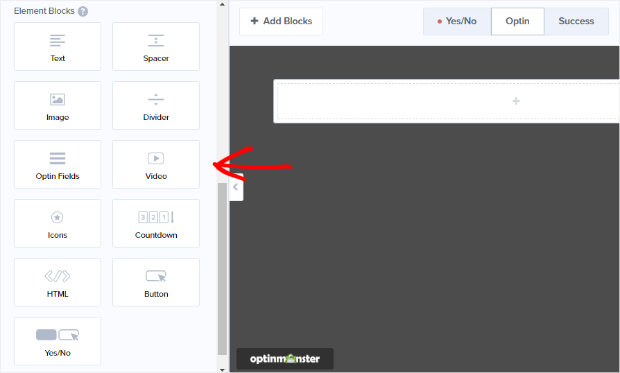 To do this, we’re going to add a new block by clicking the + Add Blocks button. Now, just like the beginning of this tutorial, drag and drop the blocks and elements you want into your campaign. Edit the text however you like to make it appealing to your audience. When you click the follow button you’re greeted with a Twitter profile summary and the option to follow, or an acknowledgment that you already are following the account. Pretty cool, but if you want to get a little fancy you can add some custom CSS to add some interest to the follow button. If you want to skip this step, no problem. You’ve added a button and some text which is plenty interesting. Just continue on to Step 6. Otherwise, let’s dive in. First, we need an image. We’re going to use a screenshot of our Twitter profile summary and edit it with our favorite image editing program to remove the blue “Following” graphic and crop the image to show only what we want it to display. The image we’re using is 475 px wide. Once you have the image the way you want it, upload it to your web server so you can use it in the CSS style. In addition to the background image, we’re going to make some other changes to the follow button: reposition the button so it appears on the right of the popup screen, add a border, and change the styling for the close button. Here’s the CSS template for your use, but be sure to update the background-image URL to the correct one. 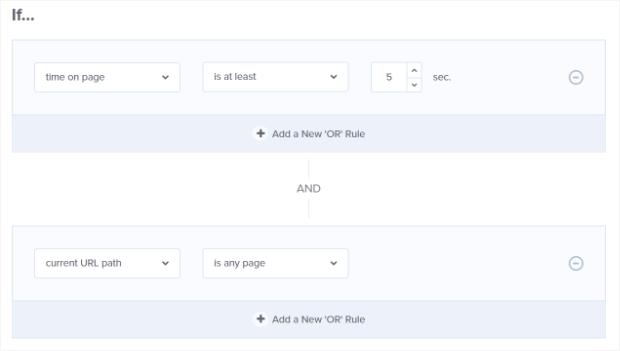 To add the CSS to your campaign go to Design » Optin Settings » Custom CSS. Once again, Save your campaign. Now we’re going to choose when the “Follow Us On Twitter” popup will display. But a better option is to show the “Follow Us On Twitter” popup only to visitors who’ve already shown they’re interested. There are many other display rule options you can use. For example, you can use our signature Exit-Intent® Technology to show the “Follow Us On Twitter” popup to visitors who are about to leave. You can also choose to show a “Follow Us On Twitter” popup depending on specific visitor behavior. 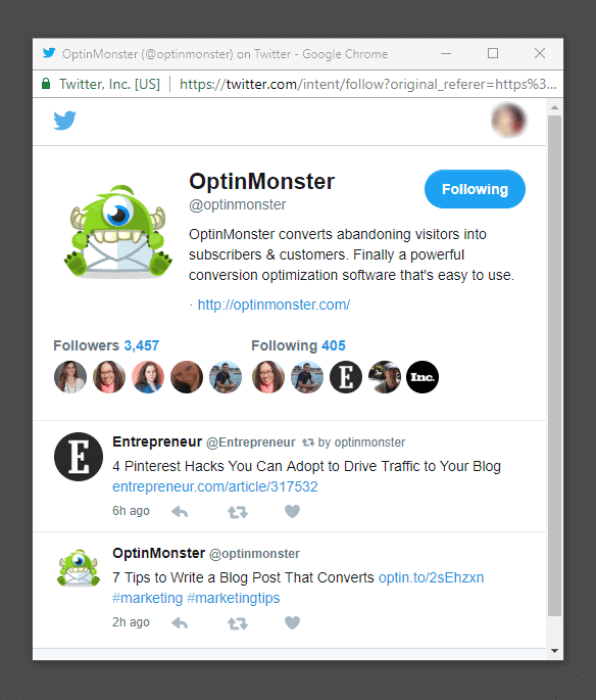 For example, if you have a blog post specifically about Twitter, you can use our advanced page level targeting to display the Twitter Follow popup on that page. 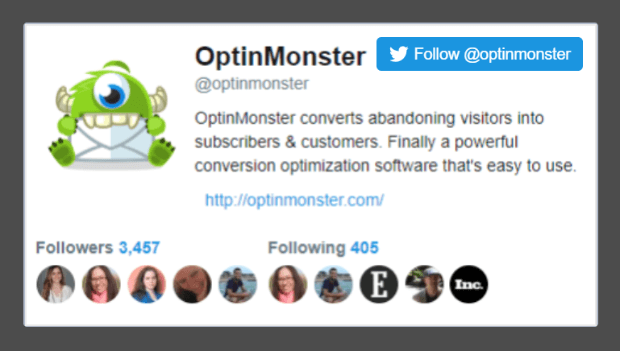 These advanced targeting options let you show the right version of the right popup to the right visitors at the right time, increasing the chances that they’ll head over to your Twitter feed and follow you. 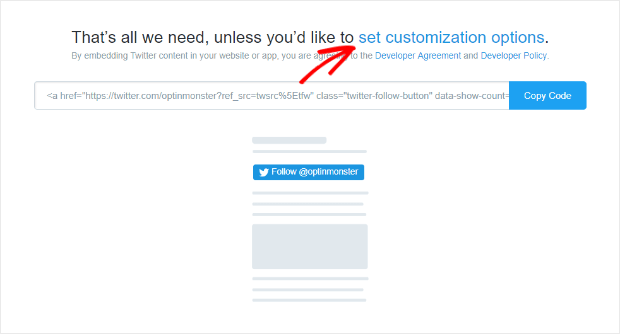 You’ve already used the Shareable MonsterLink™, but you can add your Twitter campaign to any website with the account-wide or campaign-specific embed code. 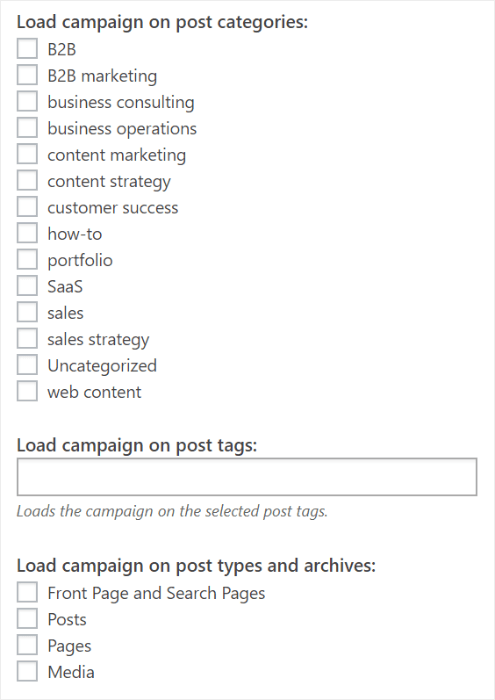 You can also easily add the campaign to a WordPress website. That’s it! 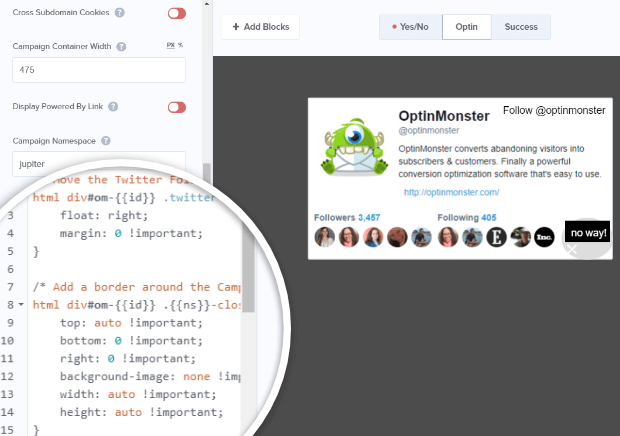 Now you can easily expand your social media network with a high converting “Follow Us On Twitter” popup. Not using OptinMonster yet? Get started today and convert more visitors into subscribers and customers than ever before!